Ralonj wèb nou www.potomitan.info/vedrine/index.php chaje ak materyèl edikatif pou ede anseyan Ayiti, elèv, ak moun k ap fè rechèch. Li pa fasil pou n enprime materyèl sa yo pou plizyè lekòl ki bezwen yo, men pou moun ki konsène, nou mande yo ede n sikile enfòmasyon an (youn di lòt pou fè lòt moun konnen kisa ki disponib sou entènèt la pou ede lekòl Ayiti). Our web link www.potomitan.info/vedrine/index.php is loaded with teaching materials to help teachers in Haiti, students, and people who are doing research. It’s not easy to print these materials for many schools in Haiti that would need them, but for people who are concerned, we ask them to help us circulate the information (one tells another to make others aware of what’s available on the net to help schools in Haiti). Also at the same time, we know it’s not everyone in Haiti who has internet access, who has a computer but we are encouraging that to be done (for at least most schools in Haiti to have a computer lab to start walking in the road of modernity to be connected with the world. We are encouraging that, encouraging people to talk about it, encouraging people to help the area or zone where they are from. Se yon bèl estrateji pou ede nan devlopman Ayiti, san pale anpil (ankouraje moun ki soti nan yon zòn ede zòn sa a nan kapasite yo, nan sa yo ka fè, san rete tann se gouvènman ki pou vin fè depi “A” jiska “Z”). Wi, n ap di li enpòtan pou gouvènman fè travay li, men n ap di tou li enpòtan pou chak sitwayen eseye ede jan yo kapab. It’s a nice strategy to help in Haiti’s development, without talking too much (encouraging people who are from an area to help that area in their capacity, in the they can do, without waiting for the government to do everything from “A” to “Z”). Yes, we are saying it’s important for the government to do its job, but we are also saying it’s important for each citizen to try to do their part. Nou antre nan ansèyman piblik an 1986 (nan vil Boston, Etazini). Esperyans kout nou pandan 3 ane ak elèv ayisyen (ki soti Ayiti) te sifi pou te ban nou yon ide jeneral de tout pwoblèm lekòl Ayiti ap konfwonte (nan tout sans). Sa te enspire n tou pou wè kisa n ka fè nan kapasite nou pou ede. We started public teaching back in 1986 (in the city of Boston, U.S). Our short experience for three years with Haitian students (From Haiti) was enough to give a general idea of all the problems schools in Haiti have been facing (in all sense). That also inspired us, to see what we could do in our power to help. Konsa, pandan ven ane, nou te travay san pran souf pou devlope yon seri materyèl pedagojik pou ede non sèlman Pwogram Bileng Ayisyen (nan tout Etazini), men tou pou itilize yo Ayiti. Tout sa nou mete sou entènèt la, yo gratis. Se jis enprime yo, fè seminè ak yo, oubyen itilize yo. That way, for twenty years, we’ve been working around the clock to develop teaching materials to help not only Haitian Bilingual Programs (throughout the United States), but also to use them in Haiti as well. All that we make available online are free. It’s a matter of printing them, use them for seminars, or making use of them. Majorite anseyan Ayiti pa t gen chans suiv kèk seminè pedagojik avan menm yo kòmanse anseye. Se pa fòt yo nonplis lè nou konn pwoblèm ki egziste yo. Se yon aktivite n ap ankouraje sitou pou anseyan ayisyen ki nan dyaspora a ta al fè Ayiti pou ede nan fòmasyon edikatè sa yo. Kòm moun k ap viv Etazini, li pa fin fasil pou n ta di tanzantan nou pral fè seminè Ayiti (pandan vakans ete) pou ede anseyan, byenke n renmen tip aktivite konsa. Nou te pran tout ide sa yo, epi n ekri yon liv ki rele Yon koudèy sou pwoblèm lekòl Ayiti. Premye edisyon an te parèt an 1994. Most teachers in Haiti didn’t have a chance to attend some teaching seminars even before they start teaching. It’s not their fault either when we know the problems that exist. It’s an activity we are encouraging, mostly for Haitian teachers in diaspora to go to Haiti to help in the formation of these educators. Living in the United States, it’s not easy to say we are going to do seminars from time to time in Haiti (during summer vacations) to help teachers, though we like this type of activity. We gathered all these ideas, and then write a book entitled A look at the problem of schools in Haiti. The first edition was published in 1994. Plizyè egzanplè al jwenn plizyè edikatè, ak bibliyotèk. Nan pale ak plizyè ladan yo, fè plis rechèch, nou te vin pase men ladan pou n te vin ak yon dezyèm edisyon an (2007). Olye pou m ta vann li pou fè lajan, nou mete l gratis sou entènèt la pou tout moun gen aksè a dokiman sa a, patikilyèman anseyan ki ta vle ede pote chanjman nan tout pwoblèm lekòl. Many copies have been given to educators, and libraries. In talking to many of them, conducting more research, we reviewed it for a second edition in (2007). Instead of selling it to make money, we made it available online for everyone to have to this document, particularly teachers who would like to help bring change in the problem schools. Roman Sezon sechrès Ayiti (te disponib sou nèt la pandan kèk tan) avan nou te vin pibliye dezyèm edisyon an (sou fòm liv) ane pase. Nou rekòmande l pou nivo mwayen e segondè. Li tou prepare ak yon seksyon Kesyon & Konpreyansyon (sou 10 chapit yo, ki an kreyòl /anglè), plis yon glosè (ti diksyonè) kreyòl – anglè pou ede moun ki pale anglè k ap aprann kreyòl. The novel Sezon sechrès Ayiti (was available online for a while) before we published the second edition (in book form) last year. We recommend it for middle school and high school levels. It has been prepared as textbook with a Questions & Comprehension section (on the ten chapters, in Creole Creole /English), including a Creole – English glossary to help those who speak English learn Haitian Creole. Nou remake majorite lekòl Ayiti pa gen yon ti bibliyotèk ladan yo, kote elèv te kapab pase tan pou chache dokiman, kopye leson nan liv yo ka pa genyen... Donk n ap ankouraje tout lekòl Ayiti kreye yon sant resous pou mete a dispozisyon kopi tout liv ak dokiman y ap sèvi. Sa ta ede timoun ki pa gen yon liv pou l kopye leson li bezwen, li dokiman l bezwen pou fè rechèch pou klas li. Nan sal resous sa a, li enpòtan pou ta gen òdinatè, enprimant (pou fè kopi trapde) ak lòt tip materyèl menm si elèv la pa ta gen lajan pou l peye pou kopi yo. Si l pa gen lajan sou li, lekòl la kapab kreye yon kont pou chak elèv, epi yo ta peye pou kopi yo annapre. Konsa, menm si elèv la poko gen yon liv, li ta kapab gen kopi chapit la trapde pou l etidye san pèdi tan. We notice that most schools in Haiti don’t have small libraries, where students could spend time looking for documents, copy lessons from book they don’t have... So, we are encouraging all schools in Haiti to create resource rooms to have samples of all books and documents available that the school is using. This will help children who don’t have a book to copy lessons, and documents needed to do research for their class. In this resource room, it would be important to have computers, printers (to make copy in a wink of time) even if the students does not have money to pay right away for the copies, the school could create an account for each student to pay later. That way, even if the student does not have the book yet, he/she can have copies of the chapter(s) (needed) quickly to study without wasting time. Malerezman pou anseyan ki poko janm gen chans suiv yon seminè lengwistik, y ap fè anpil voye monte sou sijè enpòtan sa a, pase anpil fwa yo pa jwenn espesyalis ki fran ki pou di koze yo jan yo ye. Lang se yon zouti l ye. Moun ka itilize yon zouti pou fè bon bagay ak li, konsa tou moun ka itilize l pou fè move bagay. Ann pran yon machèt pa egzanp, panse kijan moun ka itilize l (pou bon, pou move bagay). Unfortunately for teachers who never had the chance to have seminar on linguistics, they can talk a lot of non-sense, because many times they don’t find a specialist who is frank to say things the way they are. Language is a tool. People can use a tool to do good things with it, and bad things on the other hand. Let’s take a machete for instance, think how people can use it (for good and bad things). Men ann panse ak entelijans tou: ki valè timoun Ayiti ki gen aksè al lekòl gratis (kote lang enstriksyon an se fransè oubyen kreyòl), ki gen aksè prete liv (an fransè ou an kreyòl) nan yon bibliyotèk pou li, pou fè devwa lekòl yo? Nou kite repons sa yo pou lektè yo. Ann aprann itilize mwayen nou genyen, sa nou gen nan men nou. Si nou jwenn liv an fransè ou an kreyòl, ann itlize yo san oken pwoblèm, san oken konplèks pase li enpòtan pou tout timoun metrize toude lang yo, to ou ta. Epi pi devan, li pral enpòtan pou tout ti Ayisyen ta pale lang “anglè”, ki yon reyalite pou konekte yo ak lemond, pase li enposib sèjousi pou konekte ak reyalite kòmès, biznis, komès, rechèch syantifik nan lemond pou pa ta pale anglè (kòm lingua franca). But let’s think intelligently also: how many students in Haiti who have access to go to school freely (wether the teaching language is French or Creole), who have access to even borrow books (in French or Creole) from a library to read, to do their homeworks? We leave these answers for the readers. Let’s learn to use the means we have, what we have in our hands. If we can find books in French or Creole, let’s use them without any problem, without any complex because it’s important for all children to master both languages sooner or later. And further down, it will be important for all Haitians students to speak “English”, a reality to connect them with the world, because it’s impossible nowadays to get connected with business, trades, scientific research in the world without speaking English (as lingua franca). Ayiti an reta seryezman nan kad aprantisay “lang etranje” si nou konpare l ak lòt zòn nan Karayib la kote timoun yo kòmanse aprann yon lang etranje nan senkyèm ane fondamantal… Gen ase materyèl aktyèlman ki disponib pou lekòl Ayiti ta kòmanse anseye tout timoun anglè, espayòl apati senkyèm ane fondamantal. Epi nan fen segondè pou tout elèv ta gen yon konpetans avanse an kreyòl, fransè, anglè, espayòl (menm jan ak kèk lòt andwa nan Karayib la). Balon an se nan pye leta ak anseyan ayisyen si yo vle inisye chanjman sa yo pou ede lekòl Ayiti avanse. Haiti is seriously behind in learning and mastering “foreign languages” comparing to other places in the Caribbean where children start learning a foreign language from 5th grade … There are enough materials available for school in Haiti to start teaching all children English, and Spanish from 5th grade. And at the end of secondary school for all students to have an advance competence in Creole, French, English, and Spanish (same as other places in the Caribbean). The ball is before the government’s feet and Haitian teachers if they want to initiate these changes to help schools in Haiti moving forward. Anpil aktivite te ka fèt jou vandredi nan lekòl yo pou ede ak yon edikasyon praktik. Ak bezwen Ayiti, se ta yon avantay bab e moustach pou chak anseyan ta panse a aktivite yo ka fè swa nan klas yo, swa nan lekòl kote y ap anseye a pou ede elèv. Many activities could have been created on Fridays to help with a “practical education”. 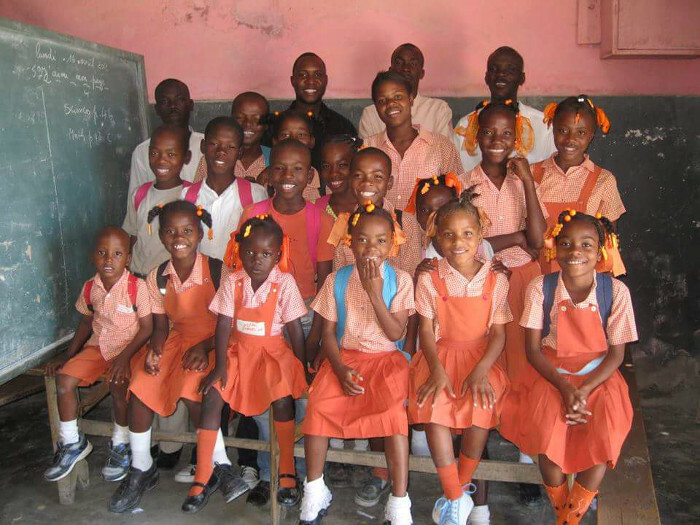 With the needs that Haiti has, it would be a great advantage for each teacher to think of activities they can do within their classroom, or within the school where they are teaching to help students. Nou ekri yon atik sou sa ki rele Ayiti: Pou yon edikasyon pratik lè vandredi, e n ap ankouraje tout anseyan ak elèv li l. Pami aktivite sa yo, nou ka site: aprann bay premye swen (pou sove lavi moun), aprann entèpretarya, aprann espò (baskètbòl, bezbòl, foutbòl, kous, natasyon, volebòl…), aprann fè atizana, aprann fè manje, aprann fè penti, aprann fè pepinyè pou rebwaze, aprann kondi e ranje traktè, aprann koud (kouti), aprann mekanik, aprann monte bisiklèt /motosiklèt, aprann naje (pou sove yon moun k ap nwaye), aprann ranje òdinatè, aprann teknik pou kannale dlo pou wouze tè, aprann teknik pou kapte dlo pou wouze tè (enkli konstriksyon rezèvwa an beton pou konsève dlo pou wouze tè), aprann teknik pou peche (nan fon lanmè), aprann yon lang etranjè (anglè, espayòl) pou sèvi entèprèt, envite pwofesyonèl (kouwè agwonòn, apantè, avoka, bòs (tout tip), enfimyè, enjenyè, kòdonyè, medsen, tayè, koutiryè… vin pale nan klas pou motive elèv (k ap panse a pwofesyon sa yo, etidye (tout tip) motè, fè soulye, pratike ar masyal (pou defann tèt ou san itilize zam). We wrote an article on that entitled Haiti: for a practical education on Fridays, and we are encouraging all teachers and students to read it. Among these activities, we can cite: learning first aid (to save someone’s life), learning to be an interpreter, learning sports (basketball, baseball, soccer, running, swimming, volleyball…), learning to do crafts, learning to cook, how to paint, how to do nurseries (of plants) for reforestation, how to drive and fix tractors, learning sewing, mechanic, learning how to ride a bicycle /motorcycle, how to swim (to save someone who is drawning), how to fix computers, technique to channel water to irrigate land, technique to capture water to irrigate land (including construction of concrete reservoirs to conserve water for irrigation, technique to fish (in high sea), learning a foreign language (English, Spanish) to be an interpreter, inviting professionals (such as agwonoms, surveyors, lawyers, skill masters (of all types), nurses, ingeneers, showmakers, doctors, tailors, dress makers… to come and speak in class to motivate students (who are thinking about these professions), studying all types of motors, making shoes, practice martial arts (to defend oneself without using weapons). Agrikilti ta dwe premye sib nan devlopman Ayiti. Ayiti: Pou yon edikasyon pratik lè vandredi. Enfòmasyon an liy pou Elèv Ayisyen & Pwofesè. Enpòtans pou dekwoche yon diplòm fen etid segondè. Eske kreyòl se yon bon zouti pou ta aprann nan lekòl Ayiti? Èske yon pwogram miltileng pral solisyone vrè pwoblèm lekòl Ayiti? Haitians and the myth about‘blacks don't read'. Ide pou kreye yon 'High School Ayisyen' prive nan Boston. Kèk kesyon pou ouvè deba sou pwoblèm edikasyon Ayiti. Konvèsasyon kat ti zanmi ki te nan 'High School. Koze lanmou (Vol. I, II, pwezi). Kreyòl, Fransè, Anglè: kilès ki towo a Ayiti?. Kreyol Without Toil: an introductory course to Haitian Creole. Le reboisement d’Haïti, un défi politique et environnemental. Lekòl an Ayiti, yon pwoblèm total-kapital. Haïti Courrier. Vol.1, #6. avril 1992. Petit lexique du créole haïtien. Peyi m rele Ayiti : My country is Haiti. Piblikasyon elektwonik ak enpòtans li nan difizyon lang kreyòl la. Premye etap avèk yon òdinatè. Pwodiksyon materyèl didaktik an kreyòl: ki pozisyon Ayisyen pran? Rate materyèl (pedagojik) nan Pwogram Bileng Ayisyen an. Some online teaching materials for Haitian Bilingual Programs & research on Kreyòl. Yon koudèy sou pwoblèm lekòl Ayiti.